Termites are of the most destructive pests around the world. They can eat away your wood furniture, under your nose. Termites cause loss of around 5 billion dollars worldwide per year. Termites consume cellulose, which is found in the cell wall of plants, woods, and in some clothes. As said, prevention is better than cure, and hence taking preventing measures against termites may help you to avoid damages to your home and ultimately saving your money. Here we have given termite prevention tips, which can help you to keep your house safe from the termites. Termites mate and emerge out in the spring season to establish new colonies. This is the time when you can encounter termites often. Most people are not aware of how to identify termites. Flying ants are sometimes mistaken as termites. 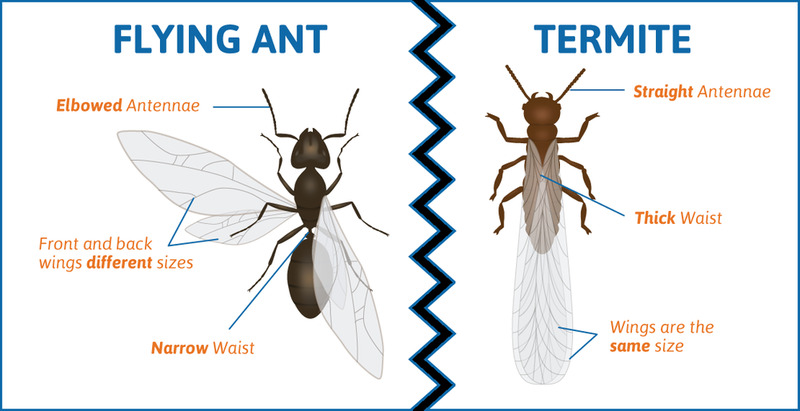 The below image shows the difference between an ant and a termite. By careful inspection, it is easy to differentiate between ants and termites. Flying ants which are also known as carpenter ants have bent antennae. They have two sets of wings, among which back wings are shorter in length than front wings. Winged termites also have two sets of wings which are equal in length. They have straight antennae on their head. Termites also live in colonies like ants. There are various classes of termites, which perform different functions such as queen, king, reproductive termites, soldiers and workers. Most commonly observed termites are workers, and soldiers. The best termite prevention starts during the planning stage and also throughout the construction. If you are constructing a house, you can plan such that there is no termite infestation in the future. Here are some tips on how to prevent termites before constructing a house. If possible construct concrete foundation for your home. Termites are not attracted to concrete. If you are constructing a wooden foundation, then rest the foundations on a concrete slab. Exposed wooden foundation can invite underground termite colonies. Grading of soil must be done such that water drains away from the foundations. Before constructing your home, make a trench around your plot and layer of basaltic termite barrier must be laid so that it can prevent termites from attacking your house. Also, termiticide can be sprayed in that trench to create a barrier for termites. If you are constructing a wooden framed house, then select timbers which are chemically treated to resist termite attack. Naturally termite resistant wood is also available from trees like cypress, pine, etc. Still, chemically treated timber has more resistivity when compared with naturally termite resistant wood. Always use termite resistant fences to cover the perimeter of your plot. Assure that every room has proper ventilation so that humidity of your house is low. High humid environment boosts the growth of termites. If you are constructing a decking in the garden or patio of your house, select composite wood decking over natural wood decking. As composite wood is made of sawdust and chemical resins, they do no attract termites. If wood flooring is to be laid in a new house, lay a layer of termite resisting chemical before laying the flooring. It will save your expensive wood flooring from the attack of termites. It is advisable to cover exposed wood surfaces with a proper sealant. If a storage room or an attic is to be constructed in your house, make sure it is ventilated properly. Otherwise, in a humid atmosphere, it will attract termites. Remove wooden scaffolding immediately after the house is constructed, as they attract termites and you give them access to your home. Also Read: Safety Precautions: Protect Your House From Burglary! Termites grow in a humid climate, and hence it is desirable that humidity in your house must be low. Repair broken roofing tiles immediately as it can give access to flying termites. Fix leaky faucets, pipes, and drains as they create a humid environment for termite growth. Keep your air conditioner drain pipe away from the foundation of your home. Plant trees and shrubs at a distance from your exterior walls. Remove dead plants and tree trunks if any from your garden. As termites love dead plants, they can attract them very easily. If you are storing firewood for cold winters, store them away from your house. Put old items or recyclable material in plastic boxes rather than cardboard. Cardboard boxes can be easily eaten by termites. Furniture of chemically treated wood must be made or purchased. Wooden furniture must be placed at some distance from walls. If possible you should select furniture made of other materials such as glass, or metals. Wooden window and door frames must be checked regularly. They must be properly sealed so that termites cannot access your home easily. Do not bury scarp wooden items, as they can be easily accessed by termites. If there are any cracks in exterior walls and foundations, they must be sealed with grout or caulk. Put bug screens in drainage pipes and gutters so as to prevent the termites from accessing your home. Carry out termite inspection regularly for wooden beams and frames. If you struck a beam with your hand, it should make a solid sound. If it makes hollow sound or echoes than, there are chances of termite infestation in it. Periodically check for any signs of termite infestation. Signs of a termite infestation include mud tunnels, bubbles in the paint around your house, and any holes in exposed wood. The aforementioned termite prevention measures can reduce the possibility of a termite infestation in your home if followed correctly. Unfortunately, there’s no guarantee that you won’t get termites. If you suspect a termite infestation, contact a licensed pest professional immediately to determine the extent of the problem and take an appropriate course of treatment of termites. Previous PostPrevious Bifold Windows: Unfold To Enjoy Unrestricted Panoramic View! Next PostNext Unlock the Secrets of Paver Block!